So today is the big day, DISTRICTS!!! So last night we had weigh-ins. I have to say I am glad we did in fact go that route as I would hat to stand in line with 2 nervous boys today before the race and deal with that. My gripe, as my first year is this. During inspection one of the cubmasters had a parent (from what I gathered) the owner of one of the tracks "helping" this guy was visibly wiggling axels and just generally being odd about how he went about checking the cars in. He also had his fingers filled with graphite getting it all over the treads as hes spinning the wheels. Maybe im just being over protective about my boys cars but is this a normal thing? Should I expect this every year? My thought is that the check in process should be as invasive as possible. My boys car wieghed in at 4.5 oz and 4.9 respectively. The one cubmaster was trying to force my oldest (the 4.5) to put more wiegh on it. He even took out a quarter and tried giving it to him, but he went undefeated in his pack level and refused any alterations other than what we did to the axels and wheels. Anyways, we are running on two 35 foot wood tracks, looks like those homemade 3 laners, I suppose we will see... Thanks everyone again for their advice/wisdom. Unfortunately the quality of volunteers at Scout races is always hit or miss. Here's to hoping that axle-wiggling guy didn't screw up any of your alignment. Best of luck to your team at the races! Thanks Vit K I appreciate that, yeah some head scratching stuff... The biggest beef I hace right now is they are just stacking a bunch of these cars ontop of each other in a small bin, anyone else ever see that? Is it pretty common!? I understand the large number of cars but I just worry about those alignments!! Probably just stressing, anyways my sons are oblivious to this. Oh to be a kid again. Stacking the cars on top of each other??? Ugh, no, that is not cool. Maybe you can volunteer to help carry cars so it can be done more gently? If i could post a picture on here I would... i got a,rowdy Tiger so I cannot volunteer but i am going to make not of it for next year and do check in in the am as opposed to the night before as those boys cars are buried. ZebsRacing wrote: If i could post a picture on here I would... i got a,rowdy Tiger so I cannot volunteer but i am going to make not of it for next year and do check in in the am as opposed to the night before as those boys cars are buried. Our Pack does check in on a different night than the races. When I joined the pack, guys were just storing cars in boxes. Something inside me screeched internally and before I knew it, I was in charge of the races the next time around. I ended up building a car storage system for holding and transporting cars without having them touch. I can write up details in a different thread if anybody's interested. Sorry to here all the bad news Zebs! You've got some good gripes on how the cars can be better inspected and handled! To miss handle the cars by stacking them on top of one another! VK I'm interested in seeing your storage system! I just want to thank you all, for your advice and knowledge. One of my boys got 3rd overall.. proud of him. Thanks guys! So today was our Pack race day, not districts. It's interesting to hear about the process you guys went through, though. We had to check-in same-day. Took about the first 45 minutes. I was honestly shocked that all they did was weigh the cars and measure them in a box during inspection. Didn't really look at wheels to ensure they were touching or inspect wheels or axles for modifications. I had to remove some tungsten putty I had on the rear of the car because it made the nose stick out just a hair. We had weighed in at a perfect 5.0oz before I had to pull a small piece of that rear putty off. Didn't re-weigh, but it couldn't have changed it too much. So, the track we were testing on must not have been standard length, because the 2.6 car became a 3.20 car. Track was four lane, all aluminum. Here's the kicker, though. I had never seen it done this way, but all racers got four heats at random, each time in a different lane. Head-to-head races didn't matter so much as the computer system simply took all four heats and averaged out the times. The final results were based on the four-race average. Has anyone else ever seen this before? We didn't place in the top three as all of those cars were in the 3.1 range, but we did well. There was a sanfu during registration and my son was somehow omitted from the pack races and had to run his car with the siblings group. They had some fast cars, too. He placed first in three races and second in the fourth, so he felt good. His average was in the low 3.20s and he would have placed somewhere in the top 7 if I had to guess in his pack group. All in all, a fun experience and we've learned a lot for next year, much of that thanks to some of you guys! You are in good spirits. And I am freaking tired sorry for the short response. I hope we all can continue to support each other on our builds throughout the year. I know for one I will be starting early..... no doubt. My son he has the sawdust in his veins now. And im all for it. S1C EM wrote: I had never seen it done this way, but all racers got four heats at random, each time in a different lane. Head-to-head races didn't matter so much as the computer system simply took all four heats and averaged out the times. The final results were based on the four-race average. Has anyone else ever seen this before? I haven't actually seen a time-only race like this, but I have heard about them here on DerbyTalk. Personally, I'd rather use a race format where finish order matters, but as long as the format is explained to everyone up front, and (here's the kicker) the track and timing system are stable so that finish times from throughout the event are truly comparable to each other, a time-only race can be okay. 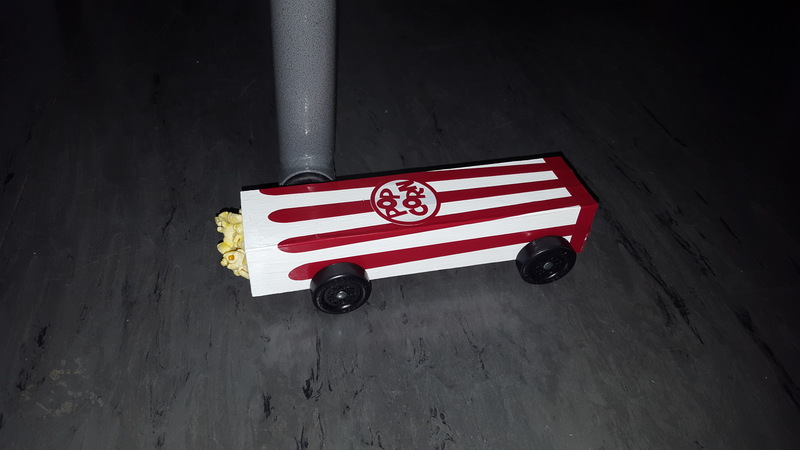 BTW, thanks for sharing the photo of the popcorn car. I love it! I didn't mind the format, but I'm not so sure about the time keeping. All heats but one seemed reasonably close. One of them had all four cars with times in the 1.2 second range and it shocked me that no one said anything about it. About 6 heats later, I walked down and talked to one of the guys putting it on to let him know. A few seconds later, a mother came up and mentioned it also. On the good side, whatever software they were using detected the anomaly at the end and notified all of the officials that something about that heat wasn't right. They did ultimately re-run it. For a moment, I was afraid all four of those cars were going to be our top four as that kind of difference in time would have given their averages a super boost. Our pack race is run that way. I like it because it mixes up the cars you run with. Our district uses lane rotation so you always have the same cars in the adjacent lanes as your car moves from right to left across the lane in each heat. In each case, your car will run once in each lane. I think the district uses lane rotation because it makes the event run faster. They only have to add one car, remove one car, and shift the remaining cars over one lane for each heat. bracketracer wrote: Our pack race is run that way. I like it because it mixes up the cars you run with. Our district uses lane rotation so you always have the same cars in the adjacent lanes as your car moves from right to left across the lane in each heat. In each case, your car will run once in each lane. I think the district uses lane rotation because it makes the event run faster. They only have to add one car, remove one car, and shift the remaining cars over one lane for each heat. Yes, ours rotated that way, too. It's a fair way to do it and to ensure that if there's a bad lane, everyone has to run on it. It definitely ran pretty fast, mainly because the computer software they were using made the rotations for them. No one had to really think too much about it to get it right.